In the invite sent by Honor, there is an emphasis on the number four, with the date being written as "444+4x4x4+(4+4)/4+44/4," which totals to 521. Honor 20 according to earlier leaks will be powered by the company’s own Kirin 980 processor. 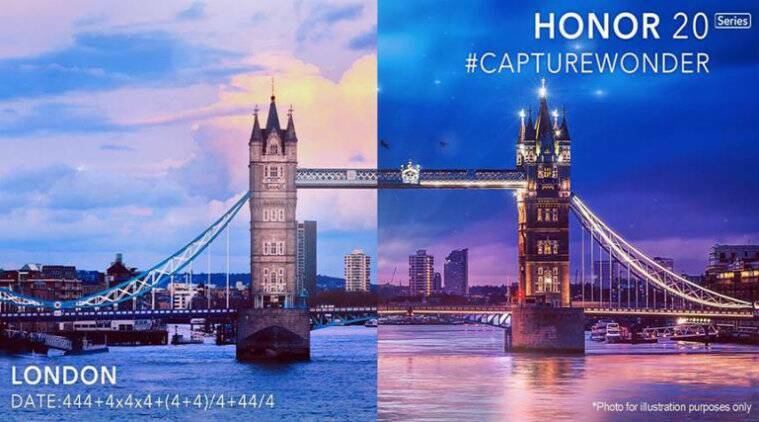 Huawei sub-brand Honor has sent out media invites for an event it will be holding on May 21 in London. At the event, the company is expected to launch its new Honor 20 series of smartphones. Just like the phones launched in the Honor 10 series, the new Honor 20 series could include the Honor 20, Honor 20 Pro, Honor 20i, Honor 20A, Honor 20C and the Honor 20X. The company has already confirmed that it will be launching the Honor 20i in China on April 17. According to a report by IANS, the series will consist of industry-first smartphones across price ranges, all of which will be launched in India soon after the global launch in London. In the invite sent by Honor, there is an emphasis on the number four, with the date being written as “444+4x4x4+(4+4)/4+44/4,” which totals to 521. The emphasis on the number four could mean that one of the smartphones in the Honor 20 series will sport a quad-camera setup on the back, like the Huawei Mate 20 Pro or the Huawei P30 Pro. Honor 20, according to earlier leaks, will be powered by the company’s own Kirin 980 processor. The device will sport a triple camera setup on the back, consisting of a 48MP primary sensor paired with a 20MP secondary sensor, and an 8MP sensor. On the front, it will sport a 32MP sensor for taking selfies. All of this will be backed by a 3,650mAh battery. Honor 20 Pro is expected to have a 6.1-inch OLED display with an in-display fingerprint sensor. The device will be powered by the Kirin 980 processor paired with 6GB/8GB of RAM, and 128GB/256GB internal storage. This might be the version that sports the quad camera setup. According to an earlier leak, it will be priced at Yuan 2,0999 (approximately Rs 30,800). The company has already hinted that the Honor 20i will have a 32P AI selfie camera on the front, inside of a waterdrop design notch. Other specifications reportedly include a 6.2-inch full HD+ display with a resolution of 2340×1080 pixels, Kirin 710 processor, 4GB/6GB RAM, 64GB/128GB internal storage and a 3,400mAh battery.